Understanding the potential bleeding changes associated with various contraceptive methods and potential lifestyle implications could help women make well-informed decisions about the specific method that best meets their needs. Despite the potential advantages of providing high-quality counseling on these topics to family planning clients, it is unclear the extent to which this happens in the field and what impact these types of messages might have on method uptake or continued use. A recent review by Polis et al.10 found few studies that have evaluated whether counseling clients on changes to menses influences method choice or improves continuation rates. The authors noted that development of a counseling tool could help health care providers better communicate with clients about potential bleeding changes associated with contraceptive use. The work described here was undertaken to address this gap. As a first step, to better understand what current guidance is available to health care providers on how to counsel women about menstrual bleeding changes and contraceptive use, we reviewed counseling, training, and reference materials developed and commonly used by international family planning programs (Table).24–34 Two clinicians independently reviewed each resource to evaluate if and how menstrual bleeding changes were addressed. They examined 6 parameters to determine whether providers were instructed to (1) describe bleeding changes clients should expect with specific contraceptive methods; (2) compare typical bleeding changes among different contraceptive methods; (3) reassure women about menstrual bleeding changes, either general or detailed reassurance; (4) describe strategies to manage inconvenient menstrual changes; (5) provide basic information about menstruation and/or menstrual hygiene; and (6) explain the potential health benefits of oligomenorrhea or amenorrhea. In addition, reviewers also noted whether providers were instructed to describe typical menstrual changes before or after a client selected a specific contraceptive method, and whether tailored information was included for special populations, such as youth or postpartum women. The information was evaluated for 4 contraceptive methods—implants, injectables, the copper intrauterine device (IUD), and the levonorgestrel intrauterine system (LNG IUS)—because of the high likelihood of these methods to change menstrual bleeding patterns. A key finding from the assessment was that menstrual bleeding changes are insufficiently addressed in the resources reviewed. In general, common bleeding changes, such as heavier or decreased bleeding, and the potential benefits of reduced or no bleeding are addressed in all of the resources evaluated; however, these topics either do not receive much emphasis or little detail is provided. Although resources often instruct providers to reassure women that bleeding changes are not a sign of illness, global evidence demonstrates that women's concerns about bleeding changes are more varied and nuanced.10 As such, family planning counselors need to be able to provide clients with general information about bleeding changes as well as communicate information tailored to clients' individual concerns. Results from the assessment of training, counseling, and reference materials are summarized in the Table. To address gaps in existing guidance and training materials, a multidisciplinary project team from FHI 360 and Population Services International (PSI) developed a simple set of counseling messages about menstrual bleeding changes associated with contraceptive use. The objective of this project, which was funded by the United States Agency for International Development (USAID), was to develop a resource that health care providers could easily incorporate into counseling sessions without substantially increasing time or effort requirements. The primary goals of the tool are to prompt providers to (1) educate women on bleeding changes associated with use of contraception, (2) address common misconceptions and fears about menstrual changes, and (3) increase women's awareness of the potential advantages of reduced menstrual bleeding and/or amenorrhea. 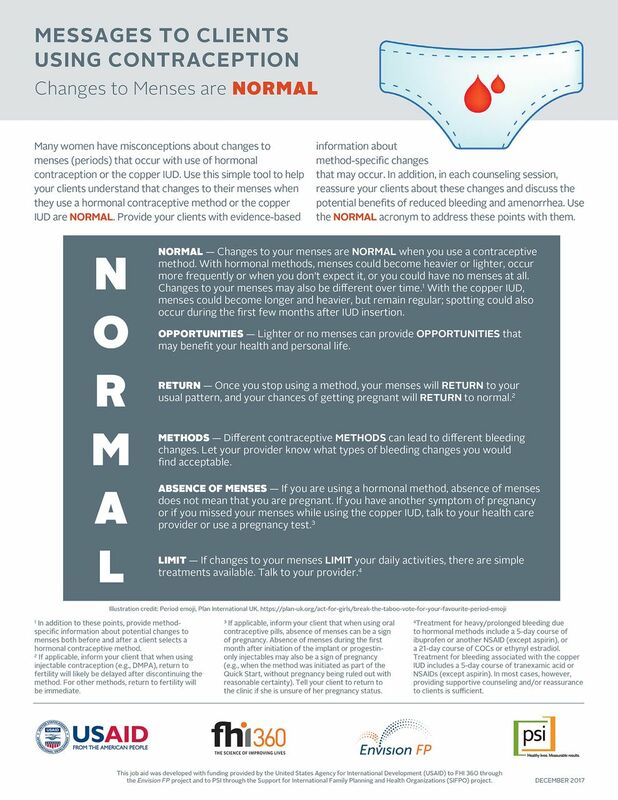 A new counseling tool uses the simple mnemonic device “NORMAL” to help providers remember important messages about menstrual bleeding changes associated with contraception. Evidence shows that use of acronyms and mnemonic devices can improve clinical practice in a range of fields, and that the introduction of simple evidence-based checklists and job aids for family planning providers can lead to increased contraceptive use in low-resource settings.38–41 Two mnemonic devices have been commonly used in international family planning programs to train providers on appropriate sequencing of counseling steps: GATHER, which stands for Greet, Ask, Tell, Help, Explain, and Return, and REDI, which stands for Rapport building, Exploration, Decision making, and Implementing the decision.42,43 The NORMAL tool complements these frameworks as well as other commonly used counseling approaches. Research has demonstrated that when delivering information about a health intervention, there is a risk of inadvertently reinforcing misconceptions among the target population.44,45 As such, all messages included in the NORMAL tool are framed in positive language that avoids repeating inaccurate information. Although only a subset of contraceptive methods was included in the initial review of international counseling and training resources described earlier, the NORMAL tool was designed to be relevant and applicable for all hormonal methods and the copper IUD. Providers who use the tool are instructed to use it both before and after a client selects a contraceptive method; they are also prompted to remind their clients to return for additional counseling and/or treatment if they have concerns about bleeding changes after method initiation. In 2017, the team that developed the NORMAL tool solicited feedback on a preliminary draft from private- and public-sector health care providers in Haiti and Zambia during family planning training workshops, and from PSI and FHI 360 reproductive health staff in Nigeria and Zambia during project meetings. The format and content of the tool were then revised based on the input received. A final version of the NORMAL tool (Figure) is also available in French, Portuguese, and Spanish; the term “NORMAL” is used in all 3 translated versions, with minor adjustments to ensure the translated content is accurate and appropriate. (To download the English and translated versions, see www.fhi360.org/resource/normal-counseling-tool-menstrual-bleeding-changes-job-aid.) Because the tool is meant to prompt providers to address key points and is not intended to be a script that is read verbatim, the expectation is that providers will be able to address the same topics using local languages with clients. Abbreviations: COCs, combined oral contraceptives; DMPA, depot medroxyprogesterone acetate; IUD, intrauterine device; NSAID, nonsteroidal anti-inflammatory drug. Changing women's knowledge and attitudes about menstrual bleeding changes associated with contraceptive use may enhance acceptability of modern contraceptive methods, reduce discontinuation rates among current users, and increase use among women with unmet need for contraception. The NORMAL counseling tool is designed to reduce common myths and misconceptions among women, improve women's knowledge of bleeding changes, and increase women's interest in the noncontraceptive benefits associated with oligomenorrhea or amenorrhea. This tool could be incorporated into facility- or community-based provision of family planning, and could be included in preservice and on-the-job training for providers. The NORMAL tool may help enhance acceptability of modern contraceptive methods, reduce discontinuation rates among current users, and increase use among women with unmet need for contraception. Before the tool is implemented on a wide scale, additional research is needed to further evaluate the feasibility and effectiveness of incorporating the NORMAL tool into family planning counseling sessions, women's comprehension of these messages, and the ultimate impact on changing providers' and women's attitudes and behaviors. In 2018, the NORMAL tool will be evaluated as part of a USAID-funded study in Malawi. Additionally, development of the tool was based on the initial review of counseling and training tools developed by international groups; an important next step would be to review national family planning guidelines and training curricula to determine if and how menstrual bleeding changes are addressed in those documents. Following that review, national stakeholders could be encouraged to incorporate the NORMAL tool into these resources, pending positive evaluation results. The authors would like to thank Jill Vitick, Rebecca Callahan, Lucy Wilson, Markus Steiner, and Laneta Dorflinger for their support of this work. Funding: This work was made possible by the generous support of the American people through the U.S. Agency for International Development (USAID). Disclaimer: The content and views expressed by the authors in this publication do not necessarily reflect the views of USAID, the United States Government, FHI 360, or Population Services International. Guttmacher Institute. Adding It Up: Investing in Contraception and Maternal and Newborn Health, 2017. [Fact Sheet.] New York: Guttmacher Institute; 2017. https://www.guttmacher.org/sites/default/files/factsheet/adding-it-up-contraception-mnh-2017.pdf. Accessed August 8, 2018.
. Unmet Need for Contraception in Developing Countries: Examining Women's Reasons for Not Using a Method. New York: Guttmacher Institute; 2016. https://www.guttmacher.org/report/unmet-need-for-contraception-in-developing-countries. Accessed August 8, 2018.
. Contraceptive Discontinuation: Reasons, Challenges, and Solutions. New York: Population Council; 2015. http://ec2-54-210-230-186.compute-1.amazonaws.com/wp-content/uploads/2016/02/FP2020_ContraceptiveDiscontinuation_SinglePage_Revise_02.15.16.pdf. Accessed August 8, 2018.
. Socio-cultural aspects of menstruation: an anthropological purview. East Anthropol. 2008;61(2):227–240. Association of Reproductive Health Professionals (ARHP). Health Matters: Understanding Menstrual Suppression. Washington, DC: ARHP; 2008 https://www.arhp.org/uploadDocs/understandingmenstrualsuppression.pdf. Accessed August 8, 2018. Population Council. The Balanced Counseling Strategy Plus: A Toolkit for Family Planning Service Providers Working in High HIV/STI Prevalence Settings. 3rd ed. New York: Population Council; 2016. http://www.popcouncil.org/research/the-balanced-counseling-strategy-plus-a-toolkit-for-family-planning-service. Accessed August 9, 2018. United States Agency for International Development, World Health Organization, United National Population Fund. Training resource package for family planning. TRP Website. https://www.fptraining.org/. Accessed August, 2017. Maternal and Child Survival Program (MCSP). Providing Long-Acting Reversible Contraception (LARC) Learning Resource Package (Modular/Facility-Based). Washington, DC: MCSP; 2017. http://resources.jhpiego.org/resources/Modular_LARC_LRP. Accessed August 8, 2018. Pathfinder International. Cue Cards for Counseling Adolescents on Contraception. Watertown, MA: Pathfinder International, 2016. https://www.pathfinder.org/wp-content/uploads/2016/12/Adolescent-Contraception-Cue-Cards.pdf. Accessed August 17, 2018. Pathfinder International. Contraceptive Implants Clinical Training: Trainers Guide. Watertown, MA: Pathfinder International, 2016. https://www.pathfinder.org/publications/implants-training/. Accessed August 17, 2018. Pathfinder International. Contraceptive Implants Clinical Training: Participant Handouts. Watertown, MA: Pathfinder International, 2016. https://www.pathfinder.org/publications/implants-training/. Accessed August 17, 2018. Pathfinder International. Comprehensive Reproductive Health and Family Planning Training Curriculum, Module 6: DMPA Injectable Contraceptive. Watertown MA: Pathfinder International; 1997. https://www.pathfinder.org/wp-content/uploads/2016/10/Module-6-DMPA-Injectables.pdf. Accessed August 17, 2018. Pathfinder International. Intrauterine Devices: Trainer's Guide. 2nd ed. Watertown MA: Pathfinder International; 2008. https://www.pathfinder.org/wp-content/uploads/2016/11/Intrauterine-Devices-Trainers-Guide-Second-Edition.pdf. Accessed August 17, 2018. Pathfinder International. Intrauterine Devices: Participant's Guide. 2nd ed. Watertown MA: Pathfinder International; 2008. https://www.pathfinder.org/wp-content/uploads/2016/11/Intrauterine-Devices-Participants-Guide-Second-Edition.pdf. Accessed August 17, 2018. World Health Organization (WHO); Johns Hopkins Center for Communication Programs (CCP), Knowledge for Health Project. Family Planning: A Global Handbook for Providers. 3rd ed. Baltimore and Geneva: CCP and WHO; 2018. http://apps.who.int/iris/handle/10665/260156. Accessed August 8, 2018.
International Contraception Access (ICA) Foundation. LNG IUS Training Manual for Family Planning. Turku, Finland; 2004. http://www.ica-foundation.org/ICA%20_LNG_manual.pdf.
. GATHER guide to counseling. Popul Rep J. 1998;26(4):1–31. www.k4health.org/sites/default/files/j48.pdf. Accessed September 14, 2018. The Access, Quality, and Use in Reproductive Health (ACQUIRE) Project. Counseling for Effective Use of Family Planning. Participant Handbook. Washington, DC: EngenderHealth; 2008. https://www.engenderhealth.org/files/pubs/acquire-digital-archive/10.0_training_curricula_and_materials/10.2_resources/fp_curric_ph_main_text.pdf. Accessed August 9, 2018. PATH. Countering myths and misperceptions about contraception. Outlook on Reproductive Health. Seattle. Seattle, WA: PATH; 2015. https://path.azureedge.net/media/documents/RH_outlook_myths_mis_june_2015.pdf. Accessed August 17, 2018.